This was meant to be a short Sunday morning Cycle ride for my Chiltern Rivers Project. I’d found a cunning route that took in the Colne Brook, and the Rivers Wraysbury and Frays. It got a little tricky about 5 miles in when a bridge over the Grand Union Canal turned out to have been removed 5 years ago. I ended up stuck on a service road wedged between the M25 and the Iver Sewage works. Lovely. The next 5 miles were better until I got a puncture in a grotty lane on the back end of Colnbrook Village. Not wanting to hang around there too long I pushed the bike to a nearby petrol station. After about half an hour of faffing around changing a Slime Tube with a tricky valve I abandoned the trip and took the fastest route back to the car. It was lucky that I did as the tube lasted only until Uxbridge necessitating a final 2-mile push towards the car. So, not very successful but still a fun ride on a bleak January day. I’ll be back in the Spring on a warmer day and better preparation. Note to anyone following routes in the Iver area. 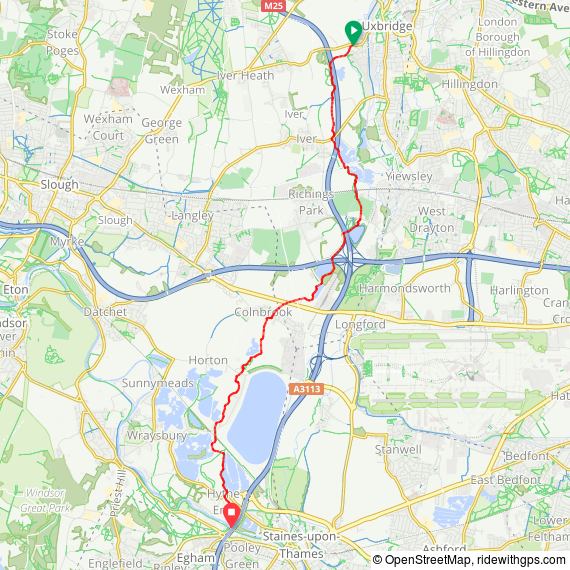 The Ride With GPS map, plus most docs that I found for the Beeches Way, show a crossing of the Grand Union Canal immediately south of Iver Sewage Works. The bridge is gone and there is no access to the canal from the route that follows the footbridge over the M25.